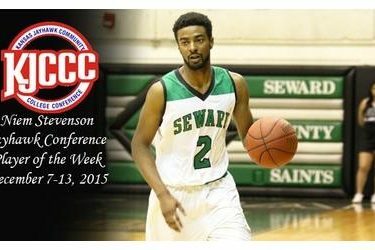 For the third time this season and sixth time in his Seward County career, Saints sophomore Niem Stevenson has been named the Jayhawk Conference’s Player of the Week for the December 7-13, 2015 period. The Jayhawk’s leading scorer, Niem Stevenson continued his assault on the league this week, averaging 26 points per game while also getting into things on the glass with 8.5 rebounds per ballgame. Wednesday against Butler, Stevenson had an ‘off’ night, scoring 16 points and pulling down 7 rebounds in a 20 point Seward County win over the Grizzlies. Saturday he was back to his old self, tying a career high with 36 points while also chalking up a double-double with 10 rebounds as the Saints fell to Pratt in a shootout in the Greenhouse. Stevenson and the Saints will enjoy a three week break before their next action on January 2nd in Independence to kick off second semester play.